Colorado has a booming beer business. 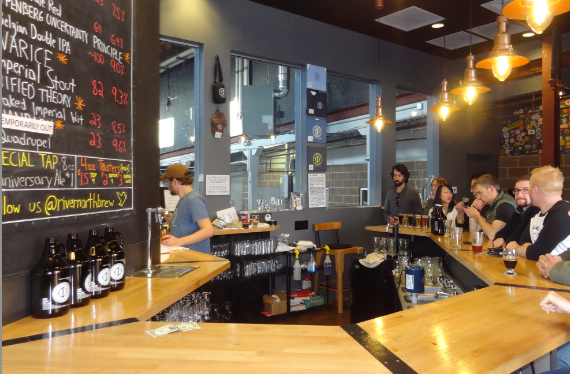 Our small city is filled with excellent beer halls and small breweries. If you are planning to visit the wonderful state of Colorado, and more specifically the city of Denver, for the upcoming North American Handmade Bicycle Show (February 22-24, 2013) or the USA Pro Cycling Challenge (August 19-25, 2013), or any Rockies baseball game, Broncos football game, Nuggets basketball game, Avalanche hockey game, or maybe you live here and are out cruising on your bike - stop in for a beer. Beers and bikes just sort of go together. 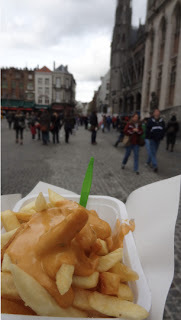 Remember my story about signing up for the Bruges and Brews class, well at that class, which covered the topics of beer and art in Belgium, I met Jeremy Schwartz. Jeremy knows beers. Especially Belgian beer and local brews. You could say it is a hobby of his; I say it makes Jeremy an invaluable guy to know. 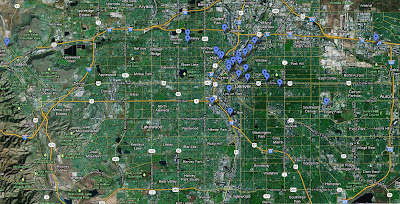 Link: The coolest Beer map of Denver & Front Range breweries and pubs ever. 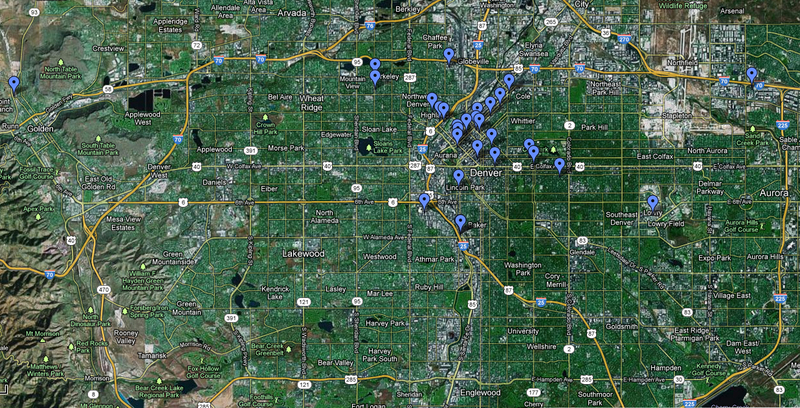 Update: March 1, 2013 - Thanks to Jeremy Schwartz, the beer map has been expanded across the Front Range of Colorado! 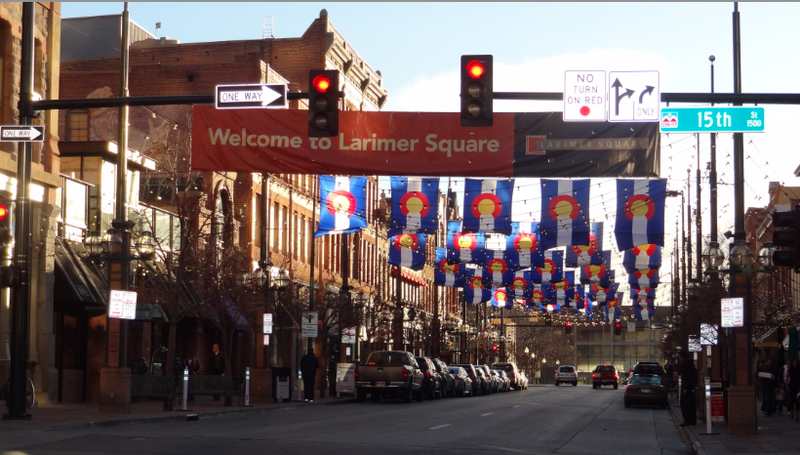 If you are visiting Denver for the North American Handmade Bicycle Show at the Convention Center in downtown Denver this weekend (I will be there too), plan on stepping out for a beer in town. 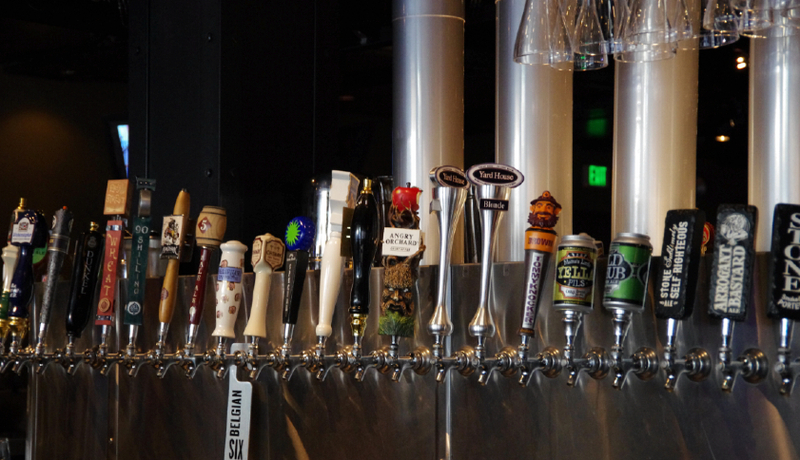 Within an easy five-block walk you will find the Yard House (135 beers on tap, standard menu). For a second nearby choice walk to Euclid Hall Bar & Kitchen (a bit more unusual fare, menu). There is a new Republica Pizza place going in at the Convention Center (good pizza) but it is not open yet. 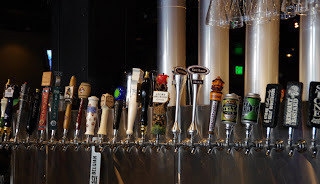 Yard House 16th St Mall and Tremont, Sheraton Hotel, 1555 Court Place, Denver, CO 80202 303-572-9273. 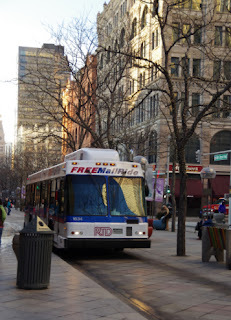 If you want to venture further away, exit the Denver Convention hall and walk directly to the 16th street Mall, hop on a free mall transit shuttle bus (find the sign and load) and get off 7 blocks northwest at Blake St., where you will be very close to both Lucky Pie Pizza and Taphouse and Freshcraft. 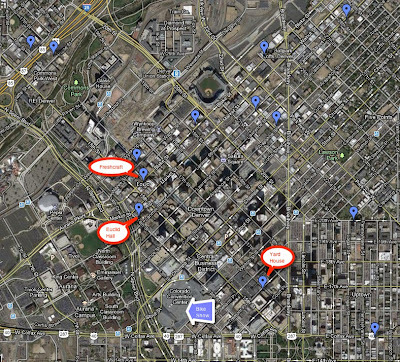 Or you may walk to Larimer Street, or to the other breweries in LoDo (Lower Downtown) listed on the beer map above. 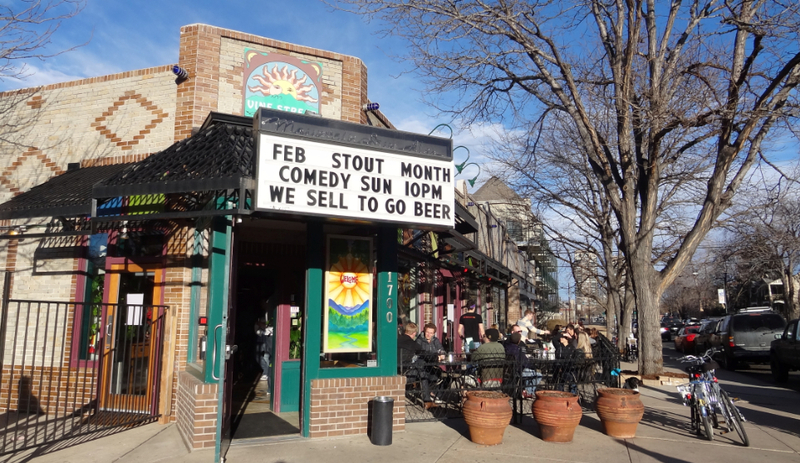 Be sure to visit Vine Street Pub while in town, it is Stout month, and the joint is hopping. After you have had your fill of bikes at the show, plan on traveling east on 17th Street, just before City Park on the left, you will find Denver's branch of the Mountain Sun Brewery. I visited last weekend and tasted a memorable oak-aged Bourbon Stout with a delicious speakeasy steak sandwich, very delicious (menu). 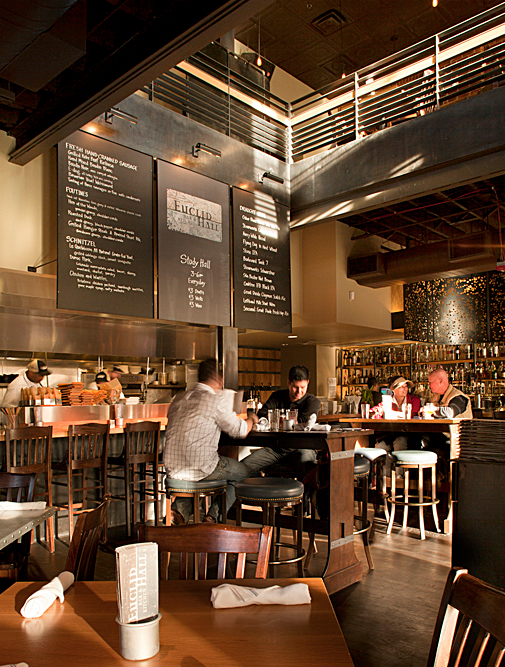 Vine Street has numerous guest beers on tap and the atmosphere is quite Denveresque. I also visited River North Brewery recently. It has the look of a real tasting room, small, with it's beer brewed on premises. Jeremy recommends his favorite: J.Marie Saison. At the Great Divide Brewery on 22nd & Arapahoe he recommends to try the Belgian seasonal: Orabelle (8.3%). You could make a point of visiting all these places if given the time. 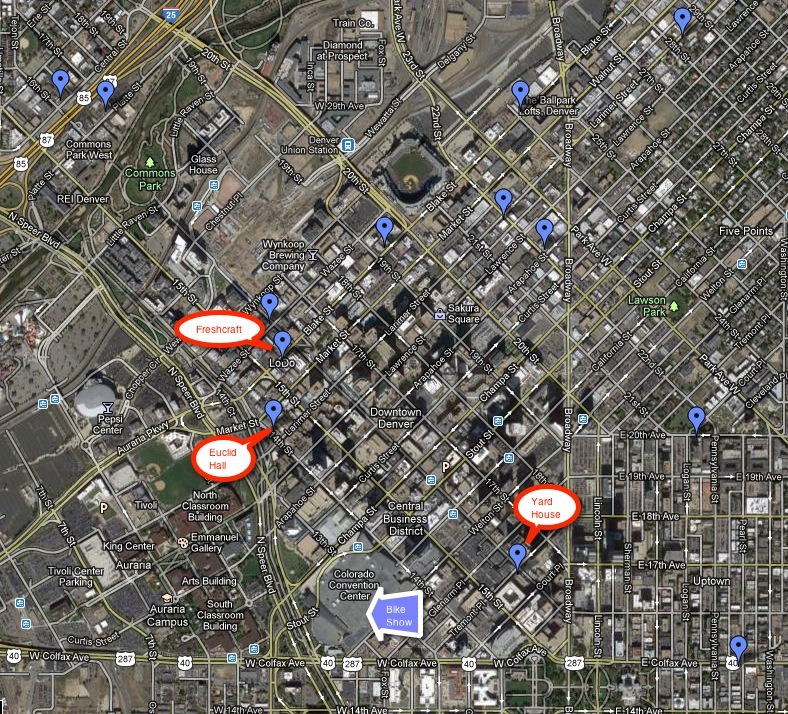 The awesome map extends to the Highlands, Golden and Aurora, but not to Boulder, a city with even more breweries. Tomorrow night is our last Bruges and Brews class. 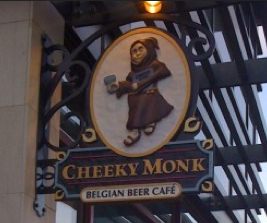 We get to go to the Cheeky Monk Belgian Beer Cafe, a bar and restaurant located a few blocks east of the State Capital Building specializing in food and beer from Belgium. The owner James is giving our final lecture, should be fun. In the coming months, the Cheeky Monk is planning on extending their location on Colfax Ave into the adjoining building next door creating a speakeasy feel with more casual seating and brewing. We have focused here on the smaller brewers in town. 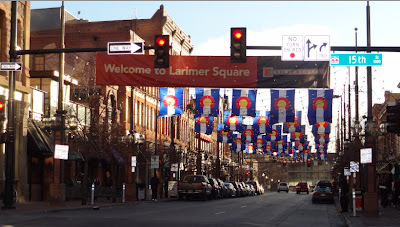 Denver also has large breweries, restaurant chains, and locations which host parties and beers including Breckenridge Brewery, Rock Bottom Restaurant and Brewery, Denver Chophouse and Brewery, and Blake Street Tavern. There is also the long established Wynkoop Brewing Company, the first place I had a beer when I moved to Denver years ago. I would recommend visiting one of the specialty brew places listed above, over these places. If you are not motivated by beer, but looking for eats of the vegetarian, gluten free or organic nature, you'll be happy with Water Course Foods (837 E 17th Ave, Denver, CO 80203) or their closer to the convention center coffee, bakery and pizza joint City O' City located at 206 E. 13th Ave, Denver, CO 80203. The Kitchen Denver serves locally grown and raised foods, wonderful dishes, located at 1530 16th Street (Entrance on Wazee St.), Denver, CO 80202. Larkburger downtown Denver (2.5 blocks from the convention center) serves a GF burger, fries, chili, and salad at 1617 California Street, Unit B, Denver, CO 80202. Although Vermont tops the list of U.S. state breweries per capita, they do no produce award winning beer. According to BigThink.com, on the tally of medals awarded at the annual Amercian Beer Festival, Colorado is #2 in the nation.